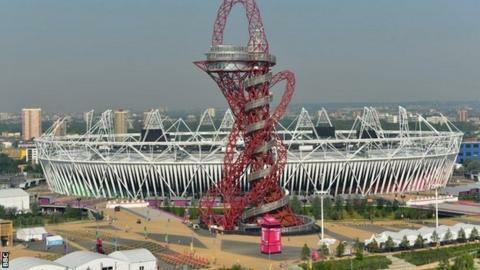 The cost of the London Olympics and Paralympics was £528m less than expected, according to the government. The combined budget for the two events was £9.29bn, but the cost has been revised to £8.77bn. It is an increase in savings of £151m since the last update in October, with a drop in policing and other security, transport and construction expenses. Sports minister Hugh Robertson said: "It is testament to the sound financial management of all involved." The figures were revealed in an update to Parliament in a written statement from the Minister for Sport Robertson following organising committee Locog publishing their final report and accounts in May. The original budget was set in 2007 and was almost four times the estimated cost at the time London bid in 2005. It was revised upwards after taking into account previously overlooked costs such as VAT, increased security costs, and an expanded brief to regenerate the lower Lea Valley area. Robertson added: "As the one year anniversary of staging the London 2012 Games approaches we can look back on last summer as a nation with a real sense of pride and be encouraged by the progress made over the last 12 months in delivering a lasting legacy. "The transformation of the Olympic Park is well under way, with the long term future of all eight major venues secured and first residents moving into the Olympic Village in the summer." The Olympic Development Agency is now transforming the apartments in the Olympic Village into thousands of new homes, removing partitions and fitting kitchens. It is due to be completed in time for occupation later in the summer and the entire project is to be completed in 2014. Temporary Games venues are also being returned to their previous use and owners.